ExxonMobil, Walmart, and McDonald’s are just a few of the companies that the mega-charity supports. With an endowment larger than all but four of the world’s largest hedge funds, the Bill & Melinda Gates Foundation is easily one of the most powerful charities in the world. 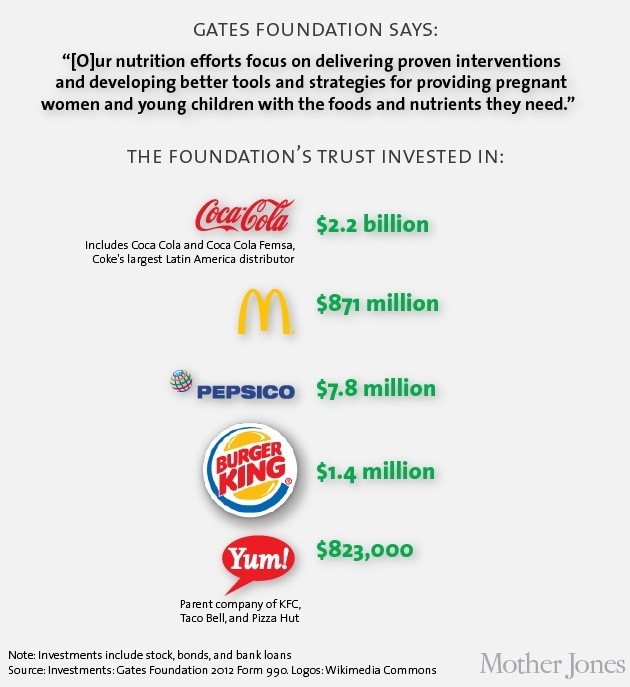 According to its website, the organization “works to help all people lead healthy, productive lives.” So how do the investments of the foundation’s $36 billion investing arm, the Gates Foundation Trust, match up to its mission? We dug into the group’s recently released 2012 tax returns to find out. In its most recent annual report to investors, private prison company GEO group listed some risks to its bottom line, including “reductions in crime rates” that “could lead to reductions in arrests, convictions and sentences,” along with immigration reform and the decriminalization of drugs. Military contractor DynCorp, meanwhile, has faced allegations of fraud, mismanagement, and even slavery from the Middle East to Eastern Europe. Real News Australia was founded in 2012 and is Australia's leading alternative news site featuring; open source journalism, current news articles that actually matter, opinionated editorials, shared news items from Australia and around the world, documentary films & video clips. We are dedicated to talking about real issues, health news, world events, political events and deciphering the main stream media garbage in order to break the cycle of propaganda. Remember: "Journalism is printing what someone else does not want printed. Everything else is public relations." - George Orwell. Please share anything you feel is worth sharing and subscribe to our emails. This operation is run on a shoestring budget so any contributions are well received. The Gates foundation certainly wants a ”healthy ” outcome for all corporations! People would seem to be bottom of the barrel, along with the planet and freedom. Why would such a kind, heartwarming, generous couple like Bill and Melinda Gates throw their charity money at Pepsi who use foetus material to improve the flavour of their drinks. This would be the same Bill Gates who is on a youtube video discussing DEpopulation and expressing how to achieve it and that VACCINATIONS ARE HIS PREFERRED METHOD. Listen for yourself. The number of Wolves in Sheeps clothing today are out of control and need CULLING.